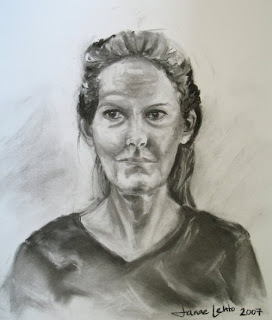 I decided to switch to charcoal for yesterday’s portrait class (1 1/2 hours). It had been a while since I’ve worked with pencil – I was just too impatient last week. I prefer using willow charcoal since it allows me to block in shapes, planes, etc instead of getting distracted with the detail. I’ve seen artists who lay down charcoal first and pick up the highlights with the eraser. I find this fascinating, but not for me. I sketch the blueprint (nothing too detailed), then block in the shadows. At this point, it’s not a pretty sight! I typically use a tissue over my index finger to blend and soften the charcoal. I push the charcoal around to create the mid tone, usually going in the direction of the contours. This really helps to build the face and allow you to see beyond the eyes, lips, nose, etc and instead, see the hills and valleys. I then take my kneaded eraser and pull out the highlights. This process is repeated as many times as it takes. I feel like a sculptor chiseling with my charcoal. As for the portrait above, using charcoal on drawing paper really created a wash look to it. Almost like pen and ink on hot press watercolor paper. I’m not sure if I like the look, so I might bring with me some charcoal paper for my next class.